Which Year is it for You? I love this quote. I saw it yesterday on the Oprah Winfrey website and today when I went back you read it again it was gone. It took me 30 minutes to find it again because I could not remember exactly the wording just the spirit of the message. 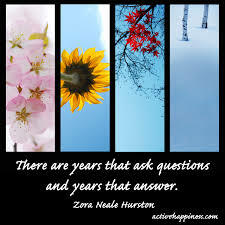 But it got me thinking about which year it will be for me, a questioning year or an answering year. Questioning years for me are years where we are shifting as a human being. They are transformation years. The status quo of your life no longer holds you, maybe you are unhappy with how your life is turning out or maybe it’s not that you are unhappy per say just unsatisfied. Or maybe circumstances in your life have forced you to change. An accident, a job loss, the loss of a loved one, something that you had no control over and it caused you to ask some soul wrenching questions. Why did this happen? How can I go on? What should I do next? Then when you think life is so hard and you will be questioning life forever, a better year comes along. You grow, whether you want to or not, you grow. Life evolves and the answers start coming. There are cycles in our lives when we need time to adjust to new circumstances but human beings can be a resilient lot, we are programed to over come obstacles. There would be no progress, no evolution, no future if we could not. And so we are blessed with answering years. Periods of time where life moves forward and we are in the zone. Light bulbs flash on all over and we can see the answers shine brightly before us. Maybe we studied hard in the questioning years and we learned the lessons or maybe the universe took pity on us and it handed us a cheat sheet that some would call luck. Doesn’t matter, the answers are there and we get a pass. We grow, we evolve, we succeed because at some level, in some way, we have changed. So, this being the start of a new year, take a few minutes and think about what type of year you think you will experience. Are you still questioning? Are you still learning a new way of being, one that is a far better version of your old self? Or is your soul itching to burst forth, hand raised in the air, eager to be part of the class and contribute your unique gifts now that you have some answers.